for Soil Testing - The apparatus consists one each of compaction mould steel, 100 mm I.D. x 127.3mm height x 1000 cc. volume, complete with collar and base plate. Compaction Rammer is 2.6 kgs in weight x 310mm controlled fall. Standard Compaction Test : The apparatus consists one each of compaction mould steel, 105mm I.D. x 115.5mm height x 1000 cc. volume, complete with collar and base plate. Compaction Rammer is 2.5 kgs. in weight x 300mm controlled fall. Face of the rammer is 50mm Standard Compaction Test : The apparatus consists one each of compaction mould steel, 101.6mm I.D. x 116.4mm height x 944 cc. volume, complete with collar and base plate Compaction Rammer is 2.5 kgs. in weight x 12” controlled fall. 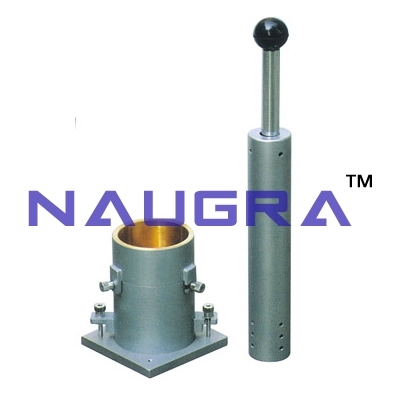 Face of the rammer is 2” NOTE : Instead of steel moulds gunmetal moulds are also available..
We are leading manufacturers, suppliers & exporters of Standard Compaction Test For Testing Lab for Soil Testing Lab. Contact us to get high quality designed Standard Compaction Test For Testing Lab for Soil Testing Lab for schools, colleges, universities, research labs, laboratories and various industries. We accept bulk orders for government tenders in all countries around the globe.